Dual wielding is using two weapons, one in each hand, during combat. It is not a common combat practice. 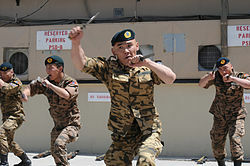 Although historical records of dual wielding in war are limited, there are numerous weapon-based martial arts that involve the use of a pair of weapons. The use of a companion weapon is sometimes employed in European martial arts and fencing, such as a parrying dagger. Miyamoto Musashi, a Japanese swordsman and ronin, was said to have conceived of the idea of a particular style of swordsmanship involving the use of two swords. In terms of firearms and handguns, this style has been popularized by television, but is generally denounced by firearm enthusiasts due to its impracticality. Though using two hand guns at a time confers an advantage by allowing more ready ammunition, it is rarely done due to other aspects of weapons handling. Dual wielding is present in many films and video games, which have the freedom of ignoring the impracticality of the style. The term itself is often invoked in the context of games. Dual wielding has not been used or mentioned much in military history, though it appears in weapon-based martial arts and fencing practices. This style of combat requires special training, since an untrained user is unable to swing both weapons at the same time. To perform an attack by the defensive weapon after the first, the user needs to perform a separate and distinct action. The use of weapon combinations in each hand has been mentioned for close combat in western Europe during the Byzantine, Medieval, and Renaissance era. The use of a parrying dagger such as a main gauche along with a rapier is common in historical European martial arts. Traditional schools of Japanese martial arts include dual wield techniques, particularly a style conceived by Miyamoto Musashi involving the katana and wakizashi, two-sword kenjutsu techniques he called Niten Ichi-ryū. Eskrima, the traditional martial arts of the Philippines teaches Doble Baston techniques involving the basic use of a pair of rattan sticks and also Espada y daga or Sword/Stick and Dagger. Okinawan martial arts have a method that uses a pair of sai. Chinese martial arts involve the use of a pair of butterfly swords and hook swords. Gatka, a weapon-based martial art from the Punjab region, is known to use two sticks at a time. The Thailand weapon-based martial art Krabi Krabong involves the use of a separate Krabi in each hand. Kalaripayattu teaches advanced students to use either two sticks (of various sizes) or two daggers or two swords, simultaneously. One of the oldest mentions of dual wielding are the gladiator style known as dimachaerus, where a gladiator would use two swords of the same length, sometimes straight and sometimes crooked midways up the blade. North American Indian tribes of the Atlantic northeast used a form involving a tomahawk in the primary hand and longknife in the secondary. It is practiced today as part of the modern Cree martial art Okichitaw. All the above-mentioned examples, involve either one long and one short weapon, or two short weapons. An example of a dual wield of two sabres is the Ukrainian cossack dance hopak. Dual wielding two handguns was said to have been popularized by the passion of gun enthusiasts and television. In modern terms, the use of a gun in each hand is most associated with the American Old West, mainly due to media portrayals. It was common for people in the era to carry two guns, but not to use them at the same time, as shown in movies. The other pistol was used as a back-up weapon. John Wesley Hardin killed a gunman named Benjamin Bradley who shot at him, by drawing both of his pistols and firing back. Mexican vaquero Augustine Chacon had several gunfights in which he was outnumbered by more than one gunman and prevailed by equipping himself with a revolver in each hand. King Fisher once managed to kill three bandits in a shootout by pulling both of his pistols. During the infamous Four Dead in Five Seconds Gunfight, lawman Dallas Stoudenmire pulled both of his pistols as he ran out onto the street and killed one bystander and two other gunmen. Jonathan R. Davis, a prospector during the California Gold Rush, was ambushed by eleven outlaws together with two of his comrades. One of his friends was killed and the other was mortally wounded during the ambush. Davis drew both of his revolvers and fired, killing seven of the bandits, and killing the rest of them with his bowie knife. In MythBusters, there is an episode in which they compared many firing stances, including having a gun in each hand and found that, compared to the two-handed single-gun stance as a benchmark, only the one-handed shoulder-level stance with a single gun was comparable in terms of accuracy and speed. The ability to look down the sights of the gun was given as the main reason for this. In an episode the following year, they compared holding two guns and firing simultaneously — rather than alternating left and right shots — with holding one gun in the two-handed stance, and found that the results were in favor of using two guns and firing simultaneously. ^ Castle, Egerton (2012-06-19). Schools and Masters of Fencing: From the Middle Ages to the Eighteenth Century. Courier Corporation. p. 51. ISBN 9780486138756. ^ Nick Jamilla (1 January 2008). Sword Fighting in the Star Wars Universe: Historical Origins, Style and Philosophy. McFarland. p. 257. ISBN 978-0-7864-5179-1. Retrieved 12 June 2013. ^ Tim Dawson PhD (2010). Byzantine Infantryman: Eastern Roman Empire C.900-1204. Osprey Publishing. p. 48. ISBN 978-1-84603-105-2. ^ Steve Shackleford (7 September 2010). Spirit Of The Sword: A Celebration of Artistry and Craftsmanship. Adams Media. p. 48. ISBN 978-1-4402-1638-1. Retrieved 12 June 2013. ^ Clifford Rogers (June 2010). The Oxford Encyclopaedia of Medieval Warfare and Military Technology. Oxford University Press. p. 240. ISBN 978-0-19-533403-6. Retrieved 12 June 2013. ^ Jerry Ahern (5 October 2010). "18". Gun Digest Buyer's Guide to Concealed-Carry Handguns. F+W Media, Inc. pp. 135–137. ISBN 978-1-4402-1767-8. Retrieved 12 June 2013. ^ Jeremy Agnew (2012). The Old West in Fact and Film: History Versus Hollywood. McFarland. p. 170. ISBN 978-0-7864-9311-1. Retrieved 12 June 2013. ^ Hardin, John Wesley (1896). The Life of John Wesley Hardin: As Written By Himself. Seguin, Texas: Smith & Moore. p. 20. ISBN 978-0-8061-1051-6. Retrieved March 30, 2011. ^ Texas Gunslinger, Outlaw and Lawman. ^ Metz, Leon Claire. 1979. Dallas Stoudenmire: El Paso Marshal. Norman, OK: University of Oklahoma Press. 162 p.
^ The Spell of the West: Captain Jonathan R. Davis. Retrieved: 2012-10-31. ^ Savage, Adam; Hyneman, Jamie (November 23, 2011). "Wheel of Mythfortune". MythBusters. Season 2011. Episode 177. Discovery Channel. ^ "Hollywood gunslingers". Mythbusters - Discovery. Retrieved 13 June 2013. This page was last edited on 4 January 2019, at 12:42 (UTC).